Vår Upa är en ale i amerikansk stil. Bryggd på tre sorters malt, humlesorterna Simcoe och Amarillo, amerikansk jäst, men framförallt Umeås fina vatten. Alltså - en Umeå pale ale. Kort och gott, Upa. UPDATED: JUN 6, 2018 Flaska från SB i Umeå. Orangegul med vitt skum. Dovt fruktig doft. Lite aprikos och annan frukt i smaken. Bottle. Light copper color. Aroma of caramel, amber malt, peach and candy. Taste has mild bitter caramel, peach, candy orange and malt. Not very outspoken or hoppy, but goes down well. Bottle, clear amber copper beer with a large white head. Aroma is fruity with notes of caramel, pine needles and tropical fruit. Flavor is fruity with notes of pine needles, caramel, tropical fruit and lime. Well balanced. Slightly hazy and fairly deep bronze. Thin head. Aroma is a lot of apricot and some pine. Taste is apricot and mandarin. 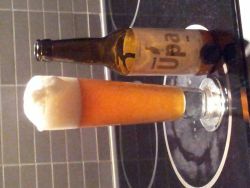 (Bottle, Stockholm Beer & Whisky Festival, 3 Oct 2015) Amber colour with foamy, off-white head. Malty, fruity nose with citrus, crystal malt and a touch of resin. Malty, fruity taste with notes of apricots, orange peel, a slightly sourish malt character and a balanced citric bitterness. Medium body, with a touch of sweetness. Maybe a bit unbalanced, but quite tasty. Quite nice. Flaske 330ml fra Systembolaget Umeå - Wasagallerian. Drukket på Rundvannet 25 Jun 15. Mørk gyldenbrun. Veldig lavt skum. Uklar. Aroma av søt karamell & frukt. Smaken mest plommer. Bra fylde. 330ml bottle provided by djoeye. Finger thick head with fine retention over a crystal clear amber coloured body. Clingy lacing down the glass. Mixed smell of caramel malts and dried fruit. Likewise, the taste profile is made up by apricot, citrus and mid-sweet malts. Rounded bittersweet ending. Well balanced and smooth in the mouth. Refreshing and moreish (Tromsø 03.07.2015). Resiny aroma with biscuits, fruits and toffee. Also some gooseberry bush. Flavour has caramel, fruits, woody notes, toffee and caramel. Finishes with minerals. Finishes with hayish malt and distant metallic tones. An APA on the malty side. Wonderful aroma and fruity with hints of grass. Much fruity and minimal carbonation which I really like. Much good and moderate bitterness which fills the front of the mouth a passable moment. Incredibly easy to drink and refreshing. Follow me @ Kung av öl @ Facebook for more pictures and ratings.